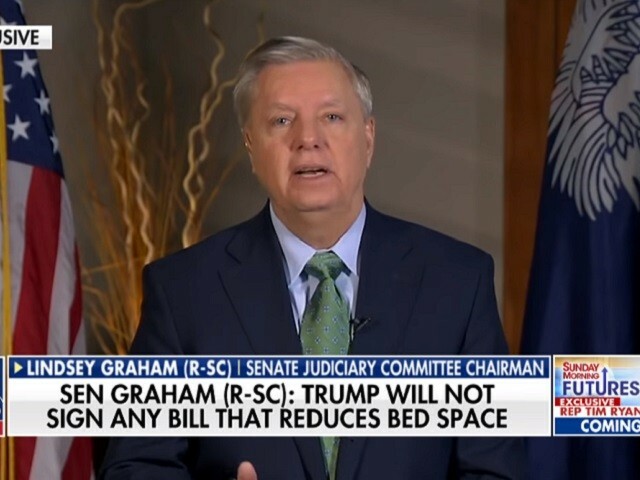 On this weekend’s broadcast of Fox Business Network’s “Sunday Morning Futures,” Sen. Lindsey Graham (R-SC) urged President Donald Trump and Republicans to reject a deal that offers border wall money for a reduction in detention bed space for Immigrations and Customs Enforcement. “It seems to be the trade-off is that we will give you a little more wall money if you will reduce the number of bed spaces available to hold people in detention, so that they don’t roam around the country, committing havoc,” Graham said. “What kind of a trade-off is that? So I would advise the president to take somewhere near $2 billion for the wall, sign a bill that would give you that much money, as a down payment, and find the rest of the money on your own, declare a national emergency, if necessary, to get the rest of the funding to build the wall that we desperately need.” “But I don’t expect him to do that deal if you have to trade off bed spaces, because that is incentivizing more illegal immigration by reducing bed spaces, and it’s really making the country far less safe,” he added.